Microsoft today announced the addition of “image match” to Bing, a new feature which lets you find more versions of the same image. When you find an image that you like, but it comes in a low resolution or otherwise poor quality, you can hit the “Image Match” button. 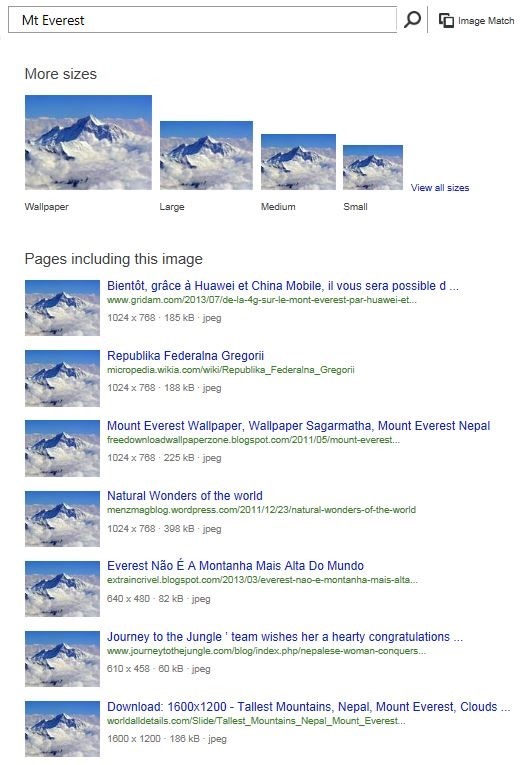 You can also click “image match” near the search box on Bing.com/images and paste the specific image URL, or even upload an image from your computer, and let Bing find all the different sizes. Google launched its “search by image” feature on June 14, 2011, meaning Bing is finally getting its own version more than two and half years later. Microsoft’s search engine continues to get better and better, but feature-parity with Google has not yet been achieved.